Overnight heavy rain gave away to a blustery morning with clouds scudding through an otherwise bright blue sky breaking up the warm sunshine. 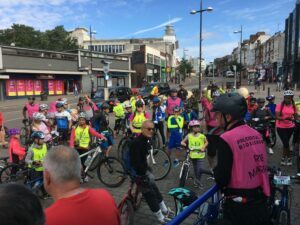 There were 19 of us gathered at Norman Park by 10 o’clock, some newbies – one rider from Sussex having heard of the widely acclaimed reputation of Bromley Cyclists had come to see for himself (well actually he was on a visit to see his sister who lives locally). There were no riders for the ride easy category today so we separated into two groups. Steve Bunn led the fast group which included three riders who were doing there final preparation for the Ride 100 next Sunday. Good luck to them; they were 9 in total. Three new members joined us today for our Ride Well event. We also shad some very impressive machinery on display, with Adam’s new Trek and a Colnago plus few other impressive bikes. I just hoped I wasn’t going to hold them all up!!? We headed off through Norman Park and up through HayesVillage. We then turned right up to Keston and on into Biggin Hill where we took a left down Jail Lane passing Cherry Lodge Golf Club and the Old Jail Inn (very tempting to stop). From there we made our way to Downe. This gave us a nice speedy ride down past High Elms Golf Course and on into Green Street Green. 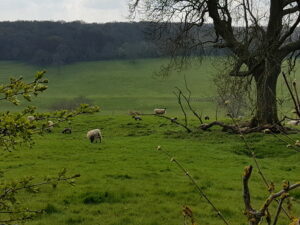 I then decided we needed another climb so headed up Worlds End Lane to ChelsfieldVillage. Another pacey stretch took us along Chelsfield Lane into St Marys Cray. Another slight climb up Poverest and into Petts Wood saw us loop round back to Norman Park. All in all a 23 miler at a reasonable pace with a good mix of climbs and fast downs. The Ride Steady Group in Petts Wood! Meanwhile the Ride steady group were led by John, Eve and Linda. They made their way out of the park and then along Walpole Road to the Whitehall Pleasure Ground. Staying on the quiet roads they made their way across the rather busy Southborough Road and onto a dedicated cycle path at the rear of Bromley Golf Course on Bromley Common and thence to Petts Wood where a cup of coffee and slice of cake was a reward for all the effort. In the absence of Isabelle it was noted that Emma worked very hard today, she was tired after a lot of excitement with her dad on a trip to London yesterday. Isabelle is at camp at the moment so we all hope she is having good time and not getting too wet and cold. After the stop Eve took the lead to take the ride on the return route through Jubilee Park and then along a new footpath which she hadn’t found before. The riders were soon heading back into Norman Park and as they were about 10 minutes early they did a quick lap of honour before meeting up with the ride well crew for a photo opportunity. The ride steady group managed 9.5 miles today.